Learn all about miniboxing in a 5 minute demo. This page will describe how the miniboxing plugin speeds up a linked list, which is modeled after the Scala collections immutable linked list. This page is based on the work of Aymeric Genet, submitted to SCALA’14. The source code is included in the miniboxing-plugin sources (benchmarking code), and benchmarking the example can be done either using the miniboxing-example project or by installing the miniboxing plugin sources locally and following the instructions here. 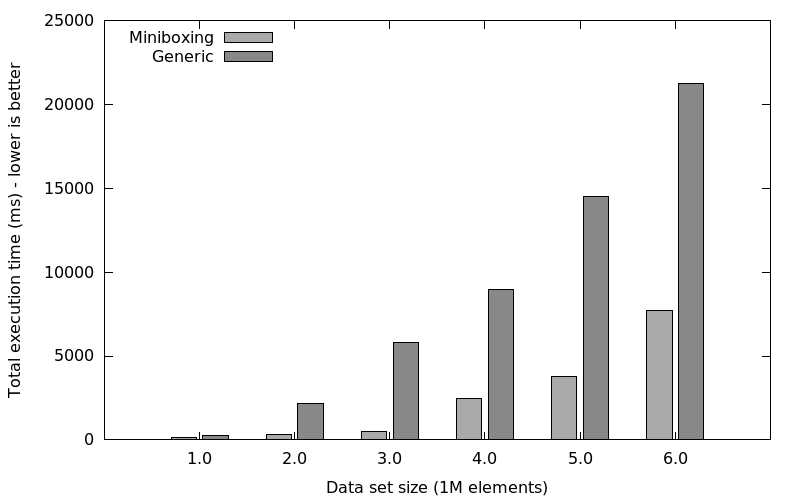 In the following section presents the common patterns that enable the high-level interface in the Scala collections, and how miniboxing can be applied in order to improve performance. Inheritance and mixins group the common behavior of different collections. This reduces code duplication and gives rise to a convenient collection hierarchy, where each level of the inheritance makes more assumptions about the architecture than the previous level. For example, the path to a linked list goes through Traversable, Iterable, Seq, LinearSeq and finally List. a mechanism to build a collection element by element, which is the builder pattern (the b in the previous example. We will also present the Numeric pattern, which is used in methods like sum or prod. The Function1 trait is provided by the standard library and can’t be overridden with a miniboxed version. Hence, in order to specialize functions, we need to provide our own function traits, which are miniboxed and perform the desugaring by hand. Then, just like methods, four different abstract traits that extend the previous interface will be created. Now, any invocation of this function will actually invoke apply_JJ, thus completely avoiding boxing primitive types, such as int and boolean. Note that this has been addressed in the 0.4 version of the miniboxing plugin. The Builder pattern also shows how type constructor polymorphism can play an essential role in factoring out boilerplate code without losing type safety. All these explanations are derived from the optimized stack trace initiator, propagator and inhibitor rules given in the tutorial. Since generic type parameters can be instantiated by any type in the language, they are bounded by Any, the top type of the Scala hierarchy. Therefore, they do not define mathematical operations, such as + or *. This can be limiting when operating with numeric types. 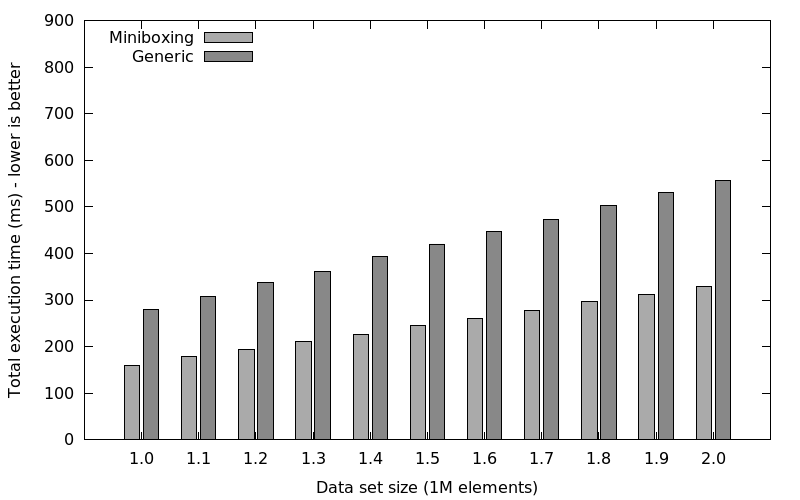 Since the Numeric implementations are likely to use primitive type parameters, boxing and unboxing would frequently occur. This is where the miniboxing steps in. With a simple @miniboxed annotation on the type parameter of the Numeric class, a concrete extension would override an optimized version for primitive types. The classes that use the Numeric objects should also have a @miniboxed annotation. This would avoid every occurrence of boxing and unboxing, and greatly enhance the performance. To evaluate the miniboxing plugin, we implemented a mock-up of the Scala collections library and benchmarked the performance. The result: 1.5x-4x speedup just by adding the @miniboxed annotation. And it’s worth pointing out our mock-up included all the common patterns found in the library: Builder, Numeric, Traversable, Seq, closures, tuples etc. To summarize, on linked lists, we can expect speedups between 1.5x and 4x, despite the non-contiguous nature of the linked list. Therefore we expect even better speedups for vectors and hashmaps, which use underlying arrays for values. Important: Don’t forget the -P:minibox:two-way flag when compiling the example! 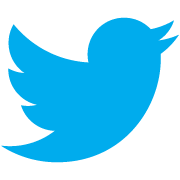 If you have questions or feedback regarding the content of this page, please leave us a comment! If you have general questions about the miniboxing plugin, please ask on the mailing List. If you found a bug, please let us know on the github issue tracker. Thanks! Looking forward to your messages!